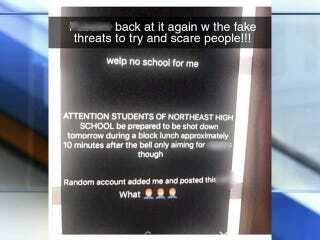 Kansas City, Mo., police are investigating after shooting threats were made against Northeast High School students—specifically, its black students. According to KSHB-TV, police have already determined that the threat originated in another state and was then reposted locally. Kansas City Pubic Schools and the local Police Department were both informed about the threat on Tuesday morning, and the Police Department noted that the FBI is involved in the investigation. The message came in a series of Snapchats that parents shared with the news station. “So excited to see the blood of helpless students as rounds and rounds pierce through the skin of the innocent see all pf [sic] you in a few hours ps not just aiming for students everyone can get some,” another threat said. Kansas City police say that so far, their investigation has uncovered that the threats were also circulated in Florida and Maryland, directed at schools with similar names. The school continued to operate on normal time on Tuesday morning, but extra security was still present, and the district immediately placed the school on “No Entry” status, Kansas City Public Schools spokesperson Ray Weikal confirmed. “As always, student safety is our top priority. Our own security team is doing an investigation and we are cooperating closely with the Kansas City Police Department investigators. At this point, we have determined that it is safe to continue with school uninterrupted but with enhanced security,” Weikal said in a statement.